Asparagus is hands down one of my favorite vegetables. I love it steamed, grilled, or roasted and in the Spring I cannot get enough of it! This simple pasta dish just screams Spring to me. My kiddos ask for seconds, which is always a win in my book! Place the scallops in a grill basket and drizzle with EVOO, salt & pepper and the juice and zest of half the lemon. Toss to coat and grill about 10 minutes, until the scallops are opaque and cooked through. Cook the pasta according to instructions, adding the asparagus for the last 4 minutes of cook time. Drain the pasta & asparagus. In the same pot, add the EVOO, the garlic, and the zest and juice of the remaining half lemon. Cook on med-high for 1-2 minutes. 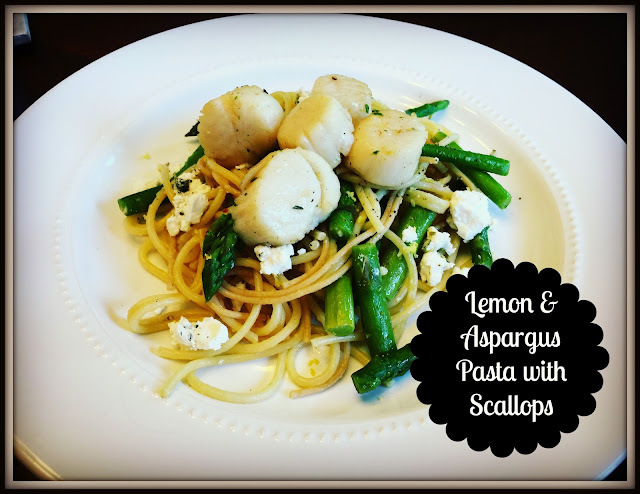 Return the pasta and asparagus to the pot and toss to coat. Season with salt & pepper.